Fort Abraham Lincoln State Park, established in 1907 is the oldest state park in North Dakota and provides a variety of unique adventures any traveler would enjoy. 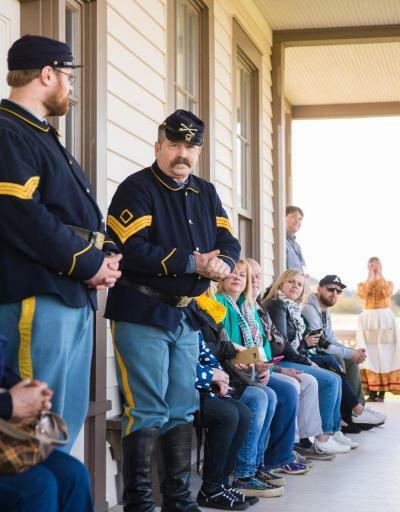 While exploring the diverse historical landscape, visitors will learn about the cultural, historical, and natural influences that make Fort Abraham Lincoln State Park known worldwide. Visitors can camp or overnight in camping cabins along the Missouri River. 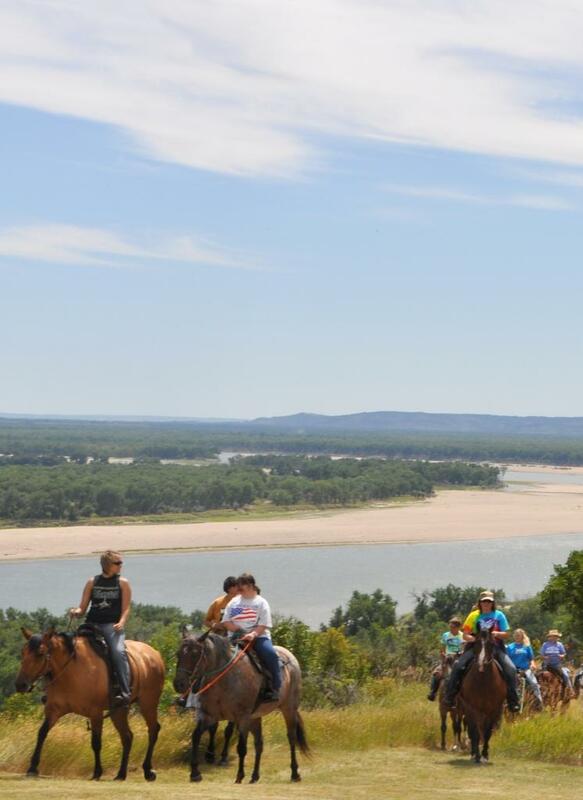 Hike, bike or horseback ride the extensive and scenic trail system that climbs through the hills providing breath-taking views of the river bottom. Anglers can fish the shorelines of both the Missouri and Heart Rivers. The vast rich history of Fort Abraham Lincoln State Park is on display in the park Visitor Center for everyone to enjoy. 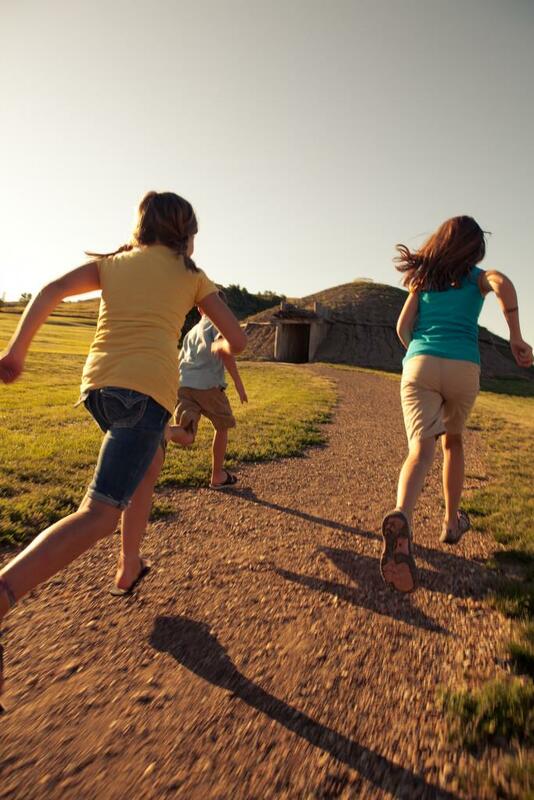 From the Visitor Center venture out to old Fort Abraham Lincoln, and tour the reconstructed military buildings, or visit the ancient village site of the earliest known inhabitants the Mandan Indians and explore their unique Earthlodge homes. Fort Abraham Lincoln State Park is home to two seasonal camping cabins. The Goodboy and Sheheke cabin are all situated next to one another along the Missouri River. The cabins are located in the main campground. 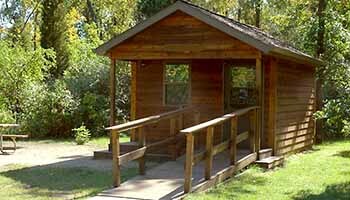 The Goodboy Cabin is the only handicap accessible cabin in the park. Looking for an economical getaway during the summer, our camping cabins are a great choice. Open seasonally, these cabins are air-conditioned and come with a small refrigerator. The cabins sleep five with one queen bed and 3 single beds, set up bunkbed style. These 18' Cheyenne tipis are sure to provide lasting memories as you camp along the banks of the Missouri River. You are greeted by a spectacular view of the Mighty Missouri as you walk out the front door of these tipis. - Smoking is not allowed in any cabins or tipis. - Game or fish cleaning in or around cabins or tipis is not allowed, please contact park staff for other arrangements. - Pets are not allowed in cabins or tipis. *Detailed information about each campsite is available on the reservation system. The Mandan village, named On-a-Slant (Miti O-pa-e-resh) because of it being built on a sloping plain toward the river, contained about 85 Earthlodges with a village population of around 1500. Unlike most Plains Indian tribes, the Mandan lived in sedentary communities in permanent homes called Earthlodges. The Mandan relied upon a mixture of fishing, hunting, and agriculture for subsistence. The men hunted and fished while the women tended crops, prepared animal hides and meat, gathered wild berries, wove baskets and made pottery. The Mandan had advanced skills in village design and defense, which were economic centers where nomadic tribes came to exchange animal skins for agricultural products. After prospering on this site for two centuries, a smallpox epidemic hit in 1781 and virtually eliminated the Heart River-region Mandan. The survivors moved north along the Missouri River, eventually joining the Hidatsa near the Knife River. When Lewis and Clark discovered the deserted On-A-Slant Village in late 1804, it was already in an advanced state of decay, for they reported that the remains included fallen heaps of earth, which had covered the houses. Today On-a-Slant Village is a state historic site and has 6 reconstructed Earthlodges including a large Council Lodge. Tours take you through the village and give visitors an insight into the lives of the Mandan people who once lived at On-a-Slant. Nearly a century after the Mandan occupied On-a-Slant village, the U.S. military established an infantry post on a bluff above the On-A-Slant ruins. In preparation for the Northern Pacific Railroad to lay its track to the west of the Missouri River basin, the military dispatched to companies of Infantry to the area. In June 1872, an infantry post, called Fort McKeen The name Fort McKeen was short-lived; the designation was changed to Fort Abraham Lincoln on November 19, 1872. In 1873 Congress authorized the addition of a cavalry post and its construction was mostly completed the same year. By 1874, Fort Abraham Lincoln housed three companies of the 6th and 17th Infantries and six companies of the 7th Cavalry, making the fort a nine-company command. With a total complement of about 650 men, the fort was among the largest and most important forts on the Northern Plains. Lt. Colonel (Brevet Major General) George Armstrong Custer was the first commander of the enlarged fort and served here from 1873 until the Battle of the Little Big Horn in 1876. Upon completion of the railroad to Montana, Fort Abraham Lincoln had fulfilled its primary purpose. Consequently, the fort gradually declined in importance in 1891 it was decommissioned. In its heyday, the fort encompassed 78 separate buildings. All of the original buildings were dismantled by area settlers and the materials used in the construction of area homes and farms. Today, dues to efforts by former Fort Abraham Lincoln Foundation reconstructed Commanding Officer’s Quarters, Central Barracks, Granary, Commissary, and Stables now stand on the site. The first development of Fort Abraham Lincoln State Park happened during the 1930s with the establishment of a CCC camp at Fort Abraham Lincoln. Young men working to support their families during the depression joined the ranks for the CCC. The CCC was responsible for the building of the park’s campground, roads, Blockhouse reconstructions, Visitor Center building, and reconstruction of 5 Earthlodges on the On-a-Slant village site. They also mapped and laid out the cornerstone markers that show were the buildings that made up Fort Abraham Lincoln and Fort McKeen stood. Today you will find just outside the park Visitor Center the 39th “CCC Worker Statue” Dedicated on June 14th, 2007 honoring all those men and the hard work they did in our North Dakota State Parks. Located in Cavalry Square is a great way to relax and enjoy your visit to the park. The store offers the finest souvenirs, a historical bookstore, and other great items to remember your trip. Use the free WiFi and enjoy a beverage from our full espresso bar serving the finest handcrafted drinks. Using only fair trade coffee roasted right here in North Dakota, treat yourself to a latte, cappuccino, or a smooth, cold brewed iced coffee. The Commissary also offers great food options. Today, the Victorian-style home of George and Libbie Custer has been reconstructed and is open for living history tours. Step back in time and learn about life at Fort Abraham Lincoln while Custer and Libbie lived in North Dakota. The On-A-Slant Indian Village is also open for tours during the summer. Learn about the Mandan culture and lifestyle and what it took to thrive for two centuries along the Missouri River. All guided tours are closed during the winter season, tours will resume in the spring. Fort Abraham Lincoln State Park is one of North Dakotas designated horse parks. This park is set up with 8 corrals and additional amenities to accommodate equestrian users. 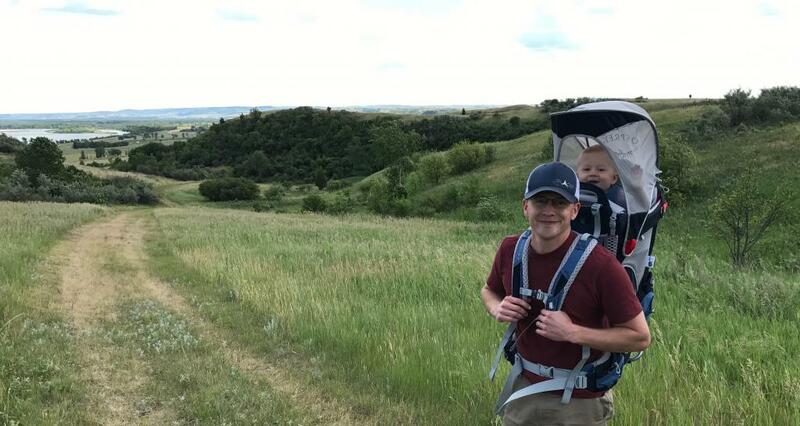 Fort Abraham Lincoln State Park's non-motorized trail system covers approximately 6.75 miles in a series of loops and several connecting segment trails that are open for hiking, biking and horseback riding. Most of the trail system surface is either grass, dirt or hard-packed single-track, with manageable grades with only a few steeper sections. The non-motorized, multi-use Scouts Trail System covers 6.75 miles in a series of loops and connecting trails. Most of the surface is hard-packed single-track, with manageable grades and only a few steeper sections. The trail system joins the Mandan-Fort Lincoln Bike Trail just north of the Infantry Post Road. The Scouts Trail System is open for hiking, biking and horseback riding. The Scouts Trail System can be accessed near the valley picnic shelter or the horse campground. This trail segment that starts at the Valley picnic shelter and meets up with the Young Hawk Interpretive Trail. The trail provides excellent vistas of the On-A-Slant Village, Missouri and Heart rivers and the city of Bismarck. This trail starts and ends at the picnic shelter. The trail contains several numbered posts and a corresponding trail guide describing the history, plant and wildlife of the area. A .88-mile trail that connects Little Soldier and Bloody Knife Trail Loops. The trail segment winds through prairie, shrublands and woodlands. The trail runs past the Post Cemetery. This trail loops visitors through the native prairie, buffaloberry and snowberry shrublands and green ash woodlands. The trail goes to the furthest reaches of the state park. A 1.97-mile loop trail starting just south of the Post Cemetery running south to the horse corrals. A portion of this trail is designated for horse and hiking use only. The trail is close to the reconstructed Cavalry Post. Bikes are not allowed within the Cavalry Square. The scenic trail offers excellent bird watching opportunities. Beginning at the confluence of the Missouri and Heart Rivers, the trail loops the campground by running along the rivers and next to the old Northern Pacific Railroad line. The trail is named in honor of Mato-tope (Four Bears). He grew up in On-a-Slant and was the son of Chief Good Boy. Mato-tope was the second Mandan Chief named Four Bears.